All students in this course pursue their academy career in top Japanese universities. Students can study with others who wants to achieve the same goals. Students who start the course from any level can enroll in this course by passing the entrance exam. The curriculum is totally different from General Japanese Course. Based on the students’ skills and needs, the curriculum in this course can be adjusted flexibly to develop Japanese skills quickly and overcome weaknesses. Students who are eligible to apply for a Top university in Japan. Students will develop speaking, listening, reading and writing skills as well as necessary skills to pass the university entrance exams. To raise the chances of students getting in universities, preparations for EJU, JLPT, essays and interview coaching will be done. Students will learn how to do presentations, they will also learn about Japanese culture and customs so that they will not have a problem catching up at their respective universities after being accepted. Students will get all necessary information of the universities in Japan and individual career counselling on a regular basis. Mock test, interview practice and guidance in writing the purpose of studying will be provided based on individual career needs. 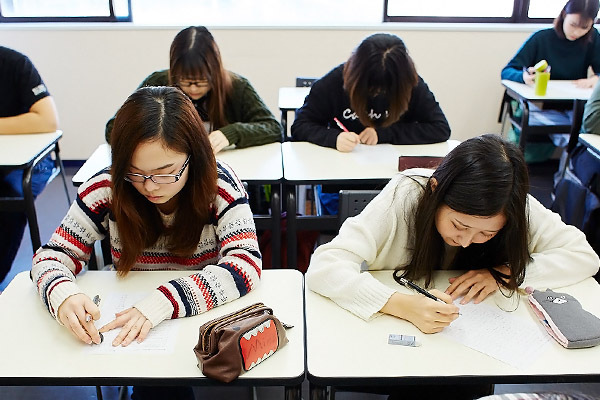 ※ The students will take mock tests more than 10 times 3 months before the actual test. The Examination for Japanese University Admission for International Students (EJU) is an examination for international students who wish to study at the undergraduate level at universities or other such higher educational institutions in Japan possessing the Japanese language skills and the basic academic abilities needed to study at those institutions . EJU will take place twice a year (June and November) in Japan and other countries and regions. Foreign students have to choose subjects according to the direction of their university study path. You can choose in English or Japanese, but the subject of Japanese have to be taken in Japanese. *ISI student got top marks in Japan at EJU of June 2017.